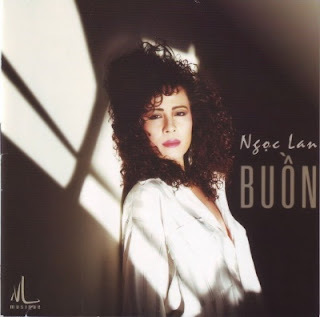 After recording solo albums for other labels such as Giang Ngoc and May Productions, finally in 1994 Ngoc Lan decided to release an album under her own label, Ngoc Lan Musique, entitled Buon (Sadness). This would be by far not her best work. The album seemed like a mishmash of contemporary songs thrown together at the last minute. None of the tracks on the album, which included the title track written by Y Van, Trai Tim Nguc Tu written by Duc Huy and a pair of uptempo songs written by Quoc Dung, Hoang Vang and Tim Dau, left any impression on me at all. It seemed Ngoc Lan's deliveries of all the songs on this album were rather mundane. I'm assuming perhaps her health matters played a significant role in her lackluster performance. But being such a devoted Ngoc Lan fan, I went out and purchased for myself a copy despite how unimpressed I was after hearing some of the tracks played on the radio for the album's promotion. If I were to choose any of the tracks on this album to be the most bearable to listen to, it would have to be Tinh Trong Phut Giay written by Ngoc Trong and to a lesser extent, Buon, the title track. I must say though, during the same year that this album had been released I had heard the title track recorded by another singer for the first time ever. That was by singer Thanh Ha on her debut solo studio album, Mot Doi Xin Nho Mai, released earlier in 1994. I usually don't like to compare Ngoc Lan with other singers, especially whenever it is in favor of anyone other than Ngoc Lan. But I must admit, I preferred Thanh Ha's rendition of Buon over Ngoc Lan's rendition here.